A few weeks ago, a Wausau family lost the home they were renting when it caught fire. It was very fortunate that this family made it out alive as it was reported that there were no functional smoke detectors in that house. It doesn't matter if you rent an apartment, townhouse, duplex or single family home from us, there will be at least one smoke detector in your unit, and often more than that. Under Wisconsin law, it is the landlord's responsibility to maintain these smoke detectors for your safety. However, under that same law, it is the tenant's responsibility to test them on a regular basis to ensure they are still working, and notify the landlord if there are any issues with the detectors, which includes a battery going dead. It is also a violation of state law to tamper with a smoke detector or render it inoperable. As part of our make ready proceedure, we test all smoke detectors to ensure they are working properly at the time you move in. We replace batteries as needed and also will often put in a new smoke detector as they normally have a useful life of less than 10 years. We also annually will replace all of the batteries in these detectors. Normally early in the year, we will give you notice that we will be entering your unit to replace these batteries. It seems like the winter season is when the most fires happen. Therefore, we do ask that you please make sure that your smoke detectors are operating properly and contact our office if they are not so we can address that issue quickly. We also ask that you don't deactivate or remove the smoke detector. We have all burned something while cooking setting off the smoke detectors. Not if but when that happens, if you took the battery out of the detector to make it stop beeping until the smoke clears, please put the battery back in. Also, please don't remove the battery out of the smoke detector to put it into something else, like a remote control or toy or flashlight. 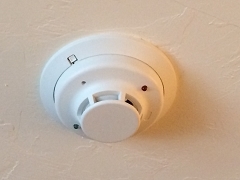 When doing apartment check outs after people move out, approximately 1 in 5 apartments have a battery completely missing from a smoke detector. What's worse is that in almost 1 in 15 move outs, we discover that a smoke detector is actually missing! Smoke detectors save lives. We all hope to never hear the high-pitched beep of one going off, however it is the job of all of us to make sure they will do their job if called upon to do so. Have a safe and joyous holiday season!! !